1. 3 pounds turkey, cooked, diced into 1/2 inch cubes. 2. 1 1/2 pound celery, diced. 4. Juice of 1 lemon. 6. 25 leaves of leaf lettuce. 8. 2 pimientos, cut into 25 small strips. 1. Place the turkey and celery in a mixing container. 2. Add the lemon juice and mayonnaise. Toss gently to blend all ingredients. 3. Season with the salt and white pepper. Toss gently a second time. 4. Line the cold salad plates with a leaf of lettuce. Sprinkle on the shredded iceberg lettuce. 5. 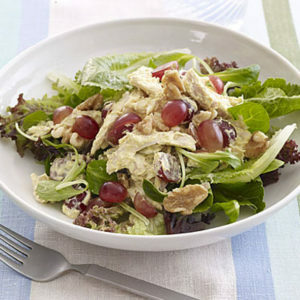 Place a mound of the salad in the center of the salad plate. Top with additional mayonnaise and a strip of pimiento. 6. Garnish with a sprig of parsley. 3. 2 heads romaine lettuce. 5. 1/2 bunch celery, diced. 6. 1 green pepper, diced. 7. 2 bunch radishes, sliced. 9. 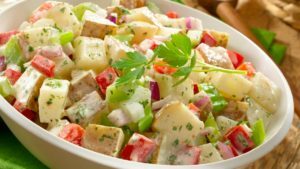 1-pint croutons (toasted or fried bread cubes). 10. 1 cup Parmesan cheese. 11. 25 red onion slices. 14. 1 pound salami, cut julienne. 15. 1 pound pepperoni, cut julienne. 2. Cut the greens into bite-size pieces. place in a mixing container and toss together gently. 3. Add the radishes, celery, green pepper, green onions and toss gently again. 4. Fill the small salad bowls. Arrange the julienne meat and onion rings over the greens and sprinkle on the Parmesan cheese. 5. Garnish with croutons, 2 tomato wedges and 2 hard boiled egg quarters. 6. Serve with an Italian salad dressing.